Welcome to all visitors. Let's hope for a great day of rugby. Pitch plan is below. First though... parking. You are very welcome to park on-site but you must follow our parking policy. Specifically DO NOT BLOCK ACCESS TO RESIDENTS' PROPERTIES OR CAUSE BOTTLENECKS THAT COULD CAUSE AMBULANCES TO BE DELAYED. 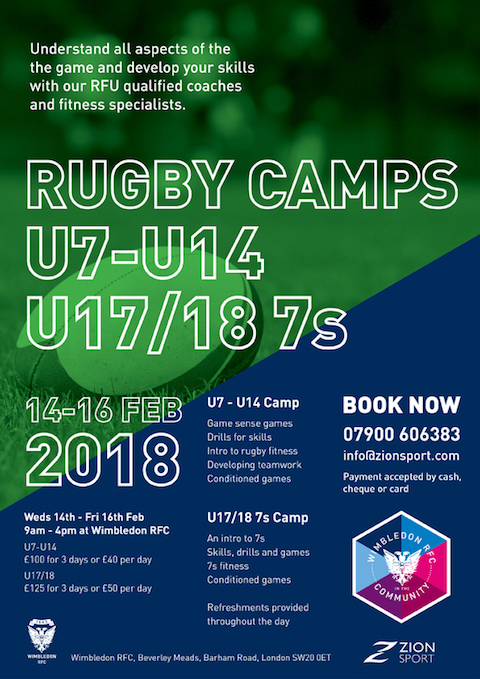 From Wednesday 14 February 2018 to Friday 16 February 2018 Wimbledon Rugby Club is hosting a brilliant half term rugby camp for U7-U14s at our Barham Road (off Copse Hill) home. The camps have a multi-sport focus, blending rugby and athletic development with the core values of the game; the most important one being enjoyment! 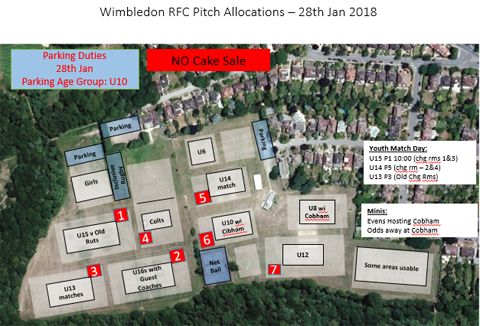 The camps are being run as part of our Wimbledon in the Community initiative. 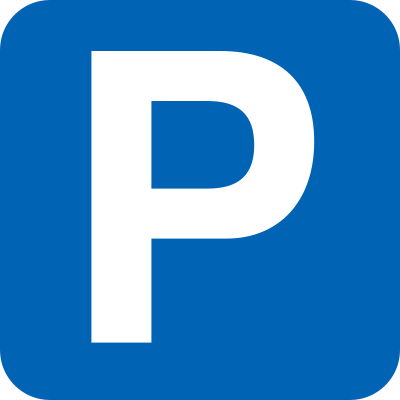 A very busy day today - welcome visitors - please follow our parking policy. Specifically DO NOT BLOCK ACCESS TO RESIDENTS' PROPERTIES OR CAUSE BOTTLENECKS THAT COULD CAUSE AMBULANCES TO BE DELAYED as the club is in the middle of private roads and we ask all club users to be mindful of the need to treat our neighbours with respect. 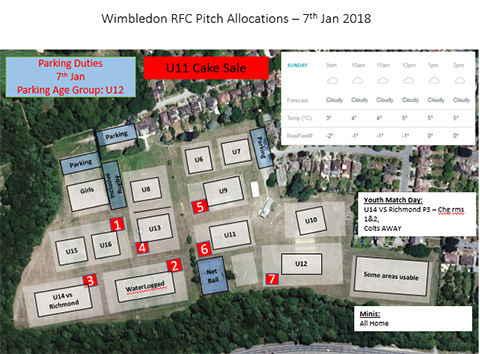 Pitch plan for Sunday 7 January 2018 - RUGBY IS BACK! After a long Christmas break rugby returns to Barham Road this Sunday (10am sharp remember!). A busy day with the U14s hosting Richmond. Here's to a great second half of the season! The club's First XV host Redruth on Saturday. 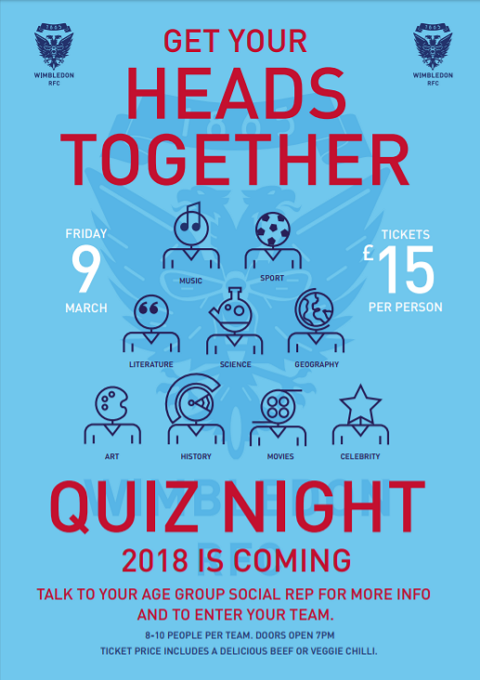 Looking for their second win of the season they'd appreciate lots of home support. KO is 2pm this Saturday (6 Jan). "Being more player-centred means that the focus is on potential rather than current ability and that the emphasis is on enjoyment and encouraging a life-long love of rugby. As our research shows, for children, enjoyment is more important than winning; especially if it means they get to play with their friends. Prioritising winning is not what children want and does not fit with the ethos of Age Grade rugby." “Sorry, I meant to say two sh**ty little islands.” Eddie Jones, England rugby union head coach, when asked to apologise for calling New Zealand “a sh**ty little island off the south coast of Australia". Wishing you all a Happy New Year. Rugby resumes Sunday 7 January 2018. 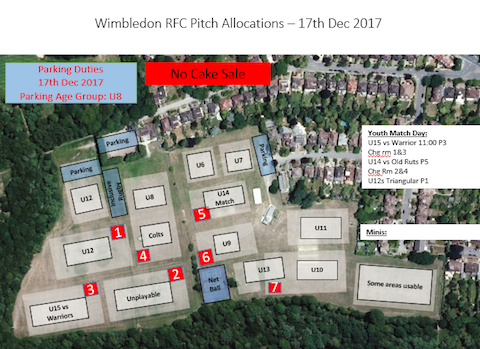 It's the Minis (U6-U11) + Girls + Inclusive Christmas Party this Sunday. The pitches are just about OK so training is on for minis. 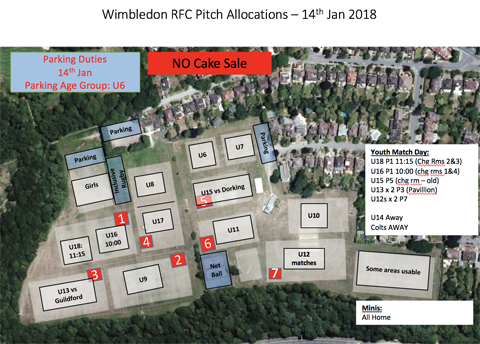 Please check the clubhouse for pitch plan allocations in case there are last minute changes (or go to where you usually go). Bacon rolls for adults available from 9am until 11.15am so please form an orderly Q! Minis presentations etc start from 11.30. Rugby takes a Christmas break for two weeks after this Sunday. Training resumes Sunday 7 January 2018 at 10am sharp. Happy Christmas to everyone. Note: U12s are away at Ironsides. Final decision: OFF due to standing water.